Bamboo must not be forgotten in the exotic garden. They demand little care and are wintergreen. Unfortunately, bamboo suffers from a bad reputation. Throughout the years, bamboo was once planted in gardens, and often it were running species like the Pseudosasa japonica. However, there are also many non-running or clumbing species (see our article: Clumping & running bamboo: everything you need to know). But it’s the running species who become the most spectacular with their thick canes. 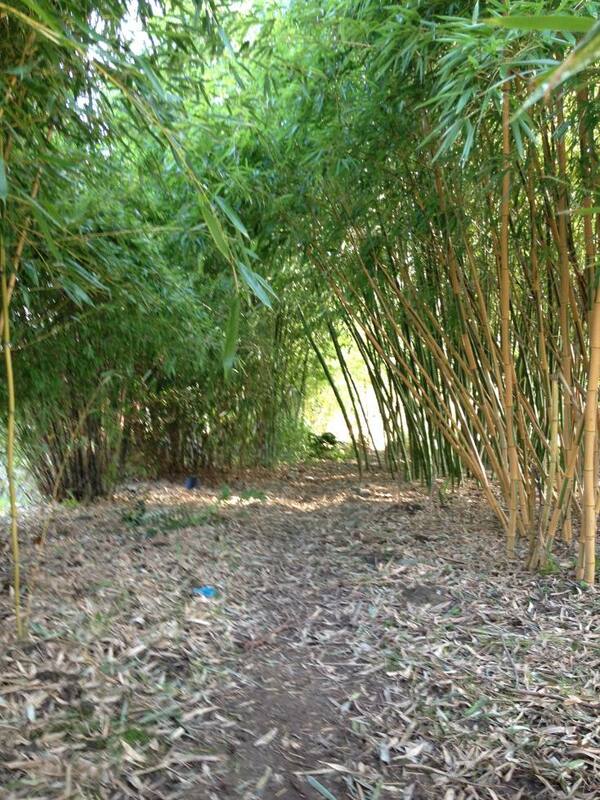 By placing a root barrier (rhizome barrier) you can however manage these bamboo species. This way you can enjoy these beautiful plants with fear for any bad surprises. 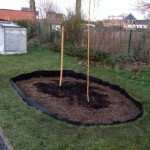 In this article you will read how to place such a rhizome barrier. Not every material is suitable as a root barrier. Bamboo has very strong rhizomes which will cross without effort materials like concrete. 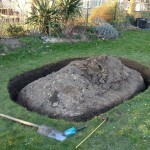 An excavated sewer pipe is therefore not an option. Neither is geotextile! 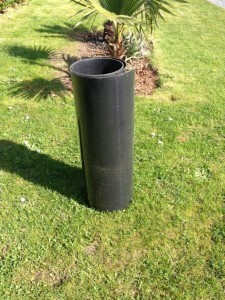 Only the special HDPE, a stiff high density polyethylene plastic sheet of at least 1mm thick, is suitable. This sheet, available at bamboo specialists, exists in different heights between 50 and 70cm (20 & 30 inches). The price is usually around € 4.50-5.00 / stretching meter. The appropriate height depends on the bamboo species. One species carries deeper than others. In addition, a few centimeters of margin above the ground must be taken into account as well. When the root barrier is too deeply dug, the bamboo can escape by running over the barrier. 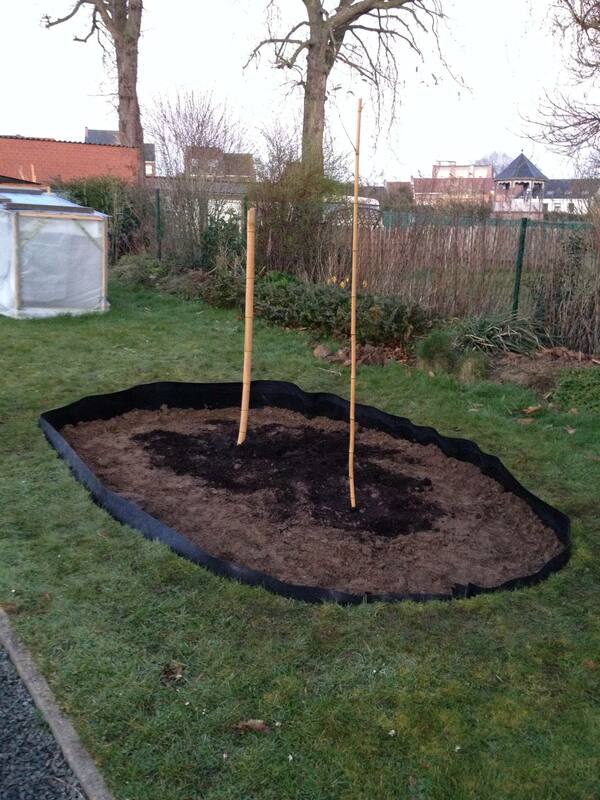 When the rhizome barrier protrudes a few centimeters above the ground, it is easier to check for any escaping runners every new season. Running bamboo generally requires ample space. In the long run, even when using a rhizome barrier, a too small place will lead to escaping runners. Only when the grove is structurally thinned this can be avoided, although the bamboo will never get as beautiful as when it does has enough space. 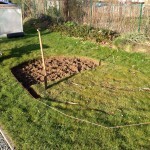 A few square meters for one grove is therefore no unnecessary luxury! 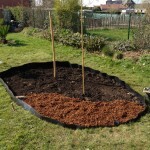 The root barrier closes the ground from the rest of the garden. 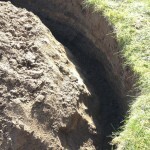 This causes the soil to dry out faster. 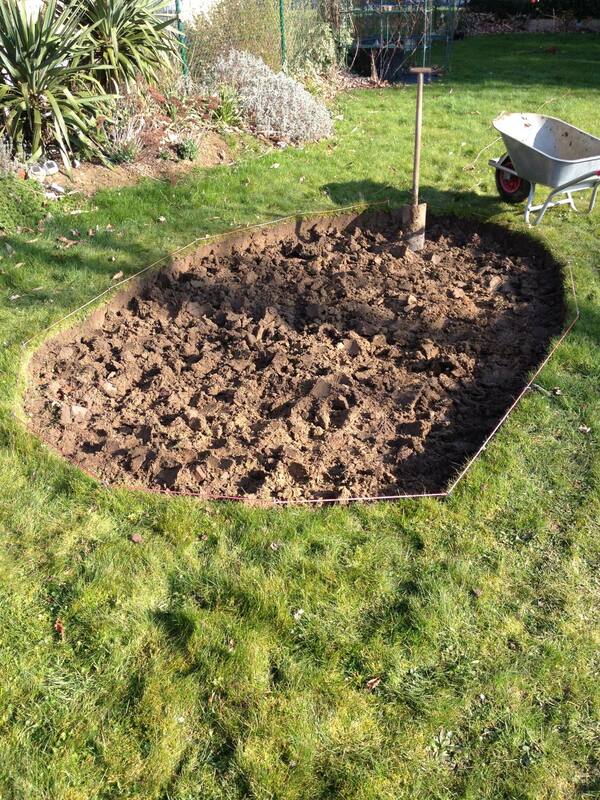 Some hobbyist however, only place a barrier on one side, but keep an eye on the open side to cut off annual rhizomes. When using a closed barrier you need to water sufficiently. 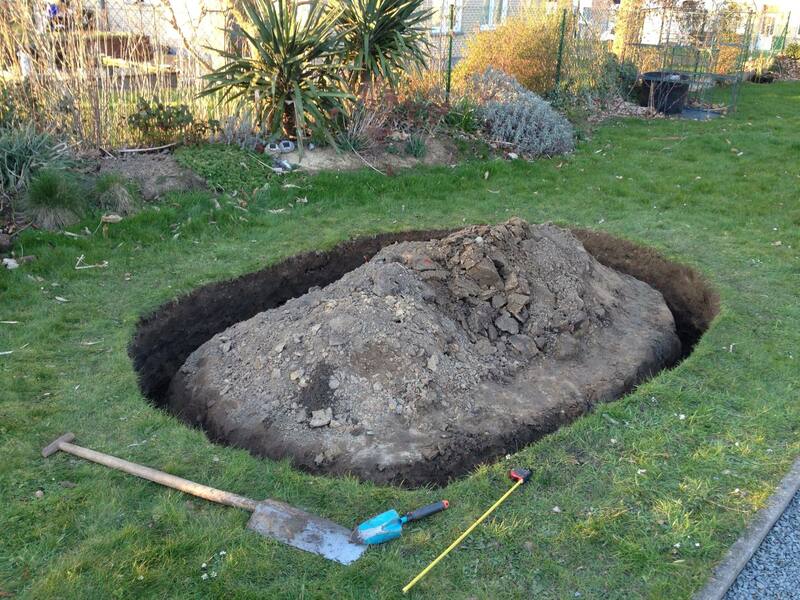 Once you have found the right spot you can start digging. Remember well that placing a root barrier is though labour! 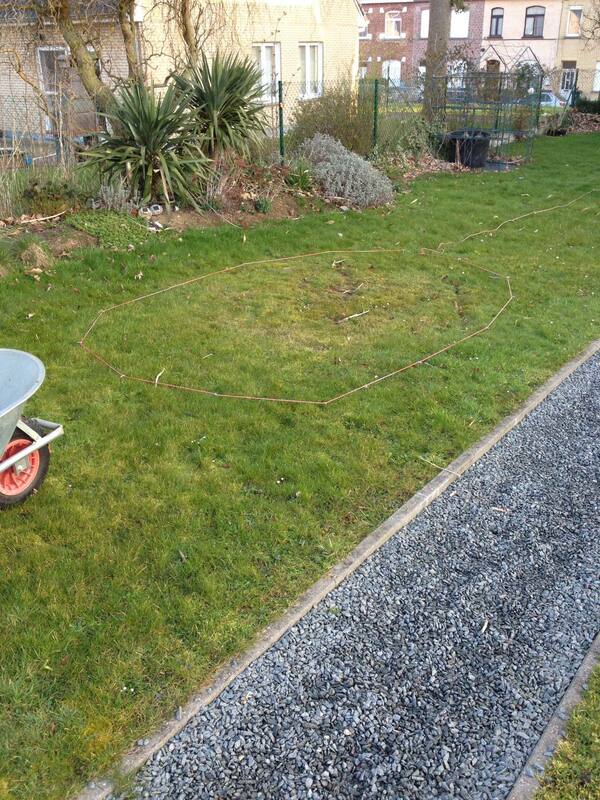 When you have determined the exact emplacement, the grass can be removed. 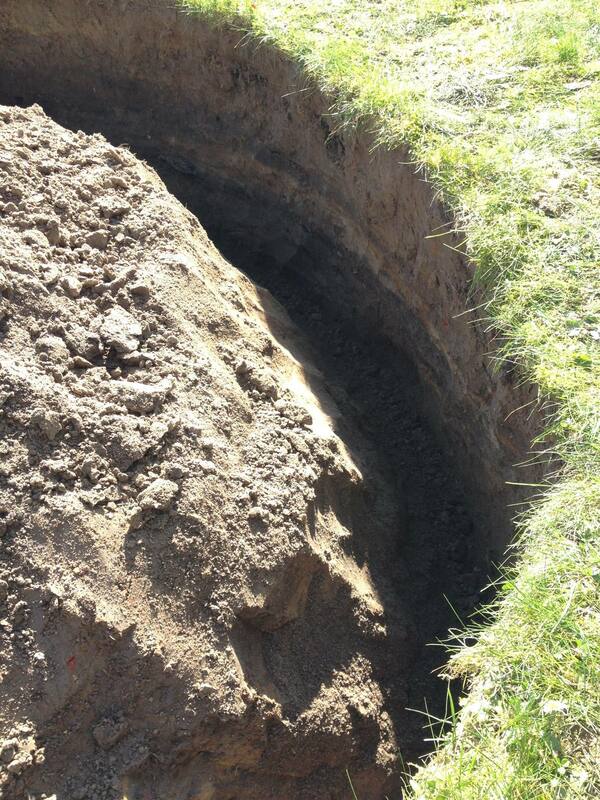 Once all the grass removed, the real digging can begin. And deep you might say! In this case a 70 cm (30 inch) barrier is installed which will protrudes a 10cm (3 inch) above ground. The chosen species doesn’t have rhizomes that deep into the ground but does escape easily over the top of the barrier. 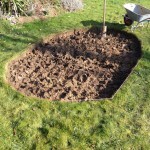 As there will be to much soil to put back again, a part of it is discharged. After many hours (!) 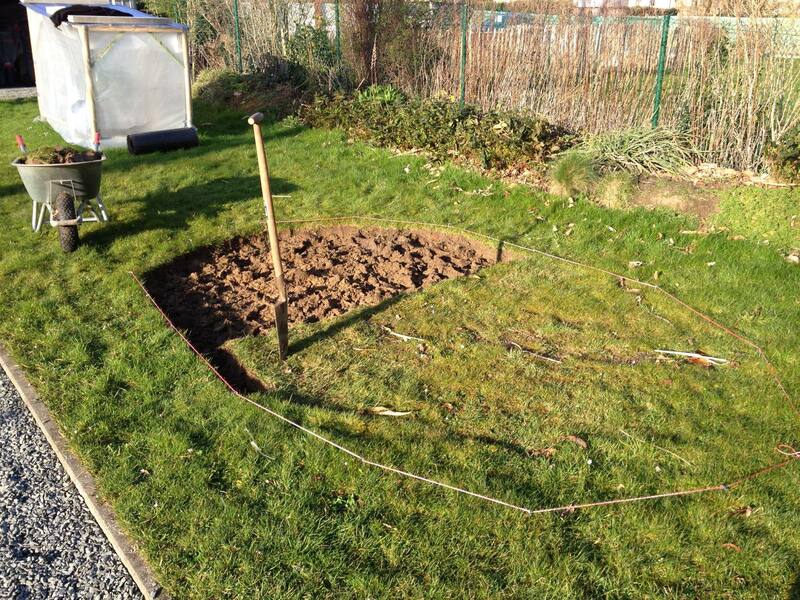 digging, the trench all way round is deep enough and the rhizome barrier can be placed. Before closing the trench, you can choose to tie the ends together (Figure 1.) 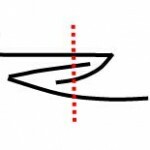 and fasten them with a bolt (red dotted line), or to tighten the ends inwardly (Figure 2.) . The advantage is that with this last method the roots are returned in the center of the grove again (red arrow). However, this closure should be kept an eye on any escaping runners. Because this is only in one place, it is very easy to do. We have chosen for this last type of closing. 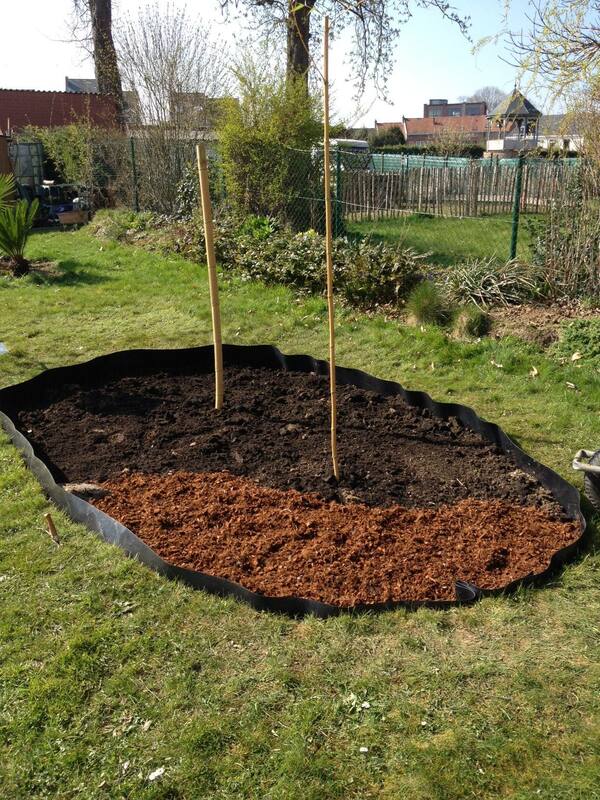 After planting the wanted bamboo species (Phyllostachys vivax ‘Aureocaulis’), the emplacement is filled with a rich soil and covered with Coocnut chips. 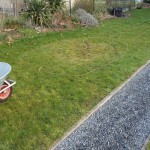 This way the emplacement stays free of unwanted weeds. In the next period regularly watering is needed. The first 3 years no pruning is needed. Afterwards you can prune yearly the thinnest (and so oldest) canes the lighten up the grove for a more healthy growth and thicker culms year after year.